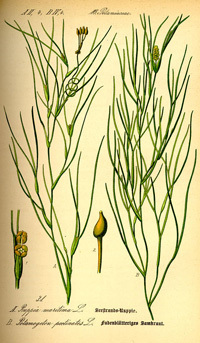 From 1 of 12 genera: Zostera, Phyllospadix, Heterozostera, Posidonia, Halodule, Cymodocea, Syringodium, Thalassodendron, Amphibolis, Enhalus, Thalassia, and Halophila. 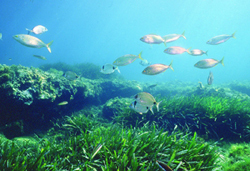 There are about 60 species of “true seagrasses” found throughout the world, although the taxonomy is disputed and often changes as research continues. These species are all found within four plant families (Posidoniaceae, Zosteraceae, Hydrocharitaceae, or Cymodoceaceae). 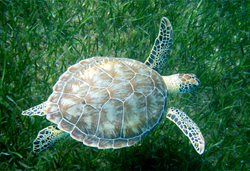 As a whole, they are not closely related, but they share characteristics associated with adapting to the marine environment. 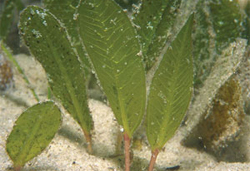 Most seagrasses live completely submerged on sandy or muddy sediments, but some species can tolerate exposure at low tide and some are capable of growing over rock. They require a very significant amount of light (15-25% surface irradiance, compared to <3% for other aquatic primary producers), which limits the depths at which they can occur. 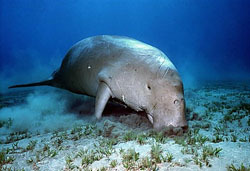 Some survive at over 40 meters in depth in clear ocean water. 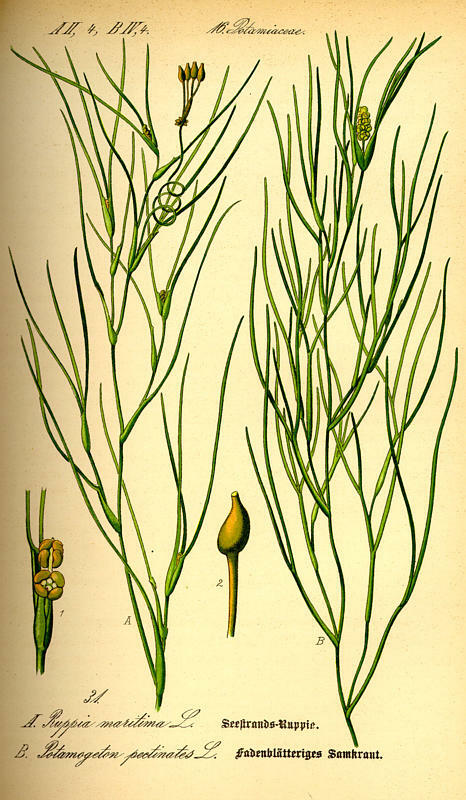 There are other aquatic plants that are sometimes grouped with seagrasses although technically they fall into a group known as “eurysaline”. This means not only are they found in estuarine (brackish) waters but continental salt waters (poikosaline) as well. 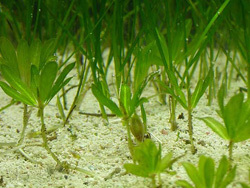 They aren’t considered “true seagrasses” because they’re not normally found in marine environments, although they can occur in very sheltered marine systems. This group can withstand large and sudden fluctuations in salinity and temperature. These types of aquatic plants fall into 1 of 3 families: Ruppiaceae, Zannichelliaceae, and Potamogetonaceae. Our representative from the “eurysaline” group on Long Island is Ruppia maritima a.k.a. widgeon grass. This species is widely distributed all over the world in temperate and tropical regions. 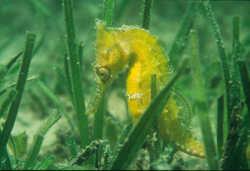 When an estuarine eelgrass bed is lost to a disturbance, sometimes we see a succession where R. maritima, an opportunistic species, will recruit into the area first, then eelgrass recruits forming a mixed species bed, and eventually eelgrass outcompetes Ruppia and dominates the system.